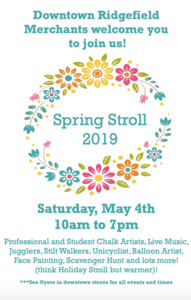 Mark your calendars: This year's Spring Stroll on Saturday, May 4, from 10 am to 7 pm , is going to be FUN for everyone!! The Downtown Ridgefield members are working together to create a family-friendly event for Ridgefield to welcome the warm weather! A professional chalk artist will be creating a very special Ridgefield-centric chalk drawing for our town, and teaching a master class to local kids in grades 6-12. The student artists will then decorate the downtown area with their drawings for local artists and 'celebrities' to judge. Throughout the village, there will be live music, jugglers, stilt walkers, hula hoopers, unicyclists, balloon artists, face painting and more. The Lounsbury House will be having a Circus Zone where you will be able to learn and test your own circus skills. And there will be a musical 'petting zoo' where you can have fun with instruments. There will even be a fun Scavenger Hunt that will lead you around town for prizes! Local member organizations and businesses will also be hosting their own in-house events. Stay tuned the the Downtown Ridgefield Facebook page for all the fun! This year, May 4 will be a busy day in the village! Besides the Spring Stroll, The Rotary Club of Ridgefield will be hosting their Ridgefield Rotary BBQ and Music Festival and the RVNA will be having their annual Health Fair at East Ridge Middle School.